Why do red, green, and blue make up all the colors? Why do red, green, and blue combinations can make up all the visible colors? Let's reminds ourselves what light is. Radio waves, micro waves, X rays and gamma rays are all electromagnetic radiation and they only differ by their frequency. It just so happens that the human eye is able to detect electromagnetic radiation between ~400nm and ~800nm, which we perceive as light. The 400nm end is perceived as violet and the 800nm end is perceived as red, with the colors of the rainbow in between. A ray of light can be a mix of any of those frequencies, and when light interacts with matter, some frequencies are absorbed while other might not: this is what we perceive as the colors of objects around us. Unlike the ear though, which is able to distinguish between a lot of sound frequencies (we can identify individual notes, voices and instruments when listening to a song), the eye is not able to distinguish every single frequency. It can generally only detect four ranges of frequencies (there are exceptions like daltonism or mutations). This happens in the retina, where there are several kinds of photo-receptors. A first kind, called "rods", detects most frequencies of the visible light, without being able to tell them apart. They are responsible for our perception of brightness. A second kind of photo-receptors, called "cones", exists in three specializations. They detect a narrower range of frequencies, and some of them are more sensitive to the frequencies around red, some to the frequencies around green, and the last ones to the frequencies around blue. Because they detect a range of frequencies, they cannot tell the difference between two frequencies within that range, and they cannot tell the difference between a monochromatic light and a mix of frequencies within that range either. The visual system only has the inputs from those three detectors and reconstruct a perception of color with them. For this reason, the eye cannot tell the difference between a white light made of all the frequencies of the visible light, and the simple mix of only red green and blue lights. Thus, with only three colors, we can reconstruct most colors we can see. 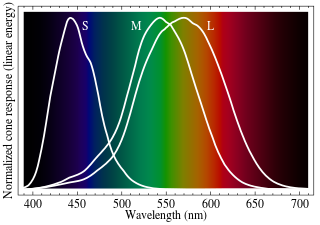 By the way, rods are a lot more sensitive than cones, and that's why we don't perceive colors in the night. 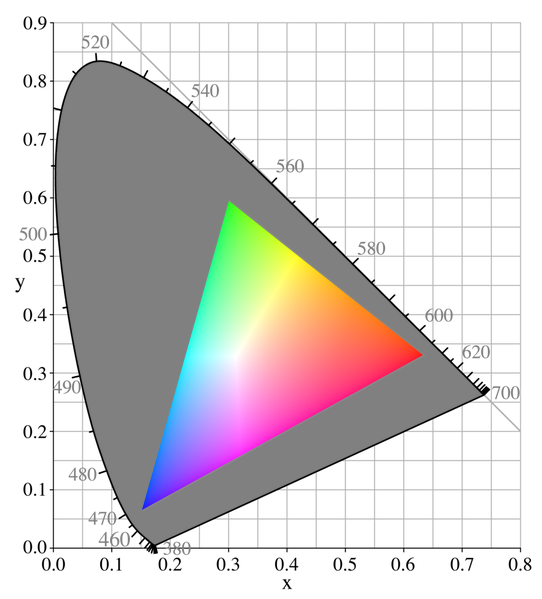 The problem with the diagrams representing the visible and RGB gamuts is that they're presented on RGB displays. They obviously cannot show you what they cannot show you : the area inside the parabola but outside of the triangle. 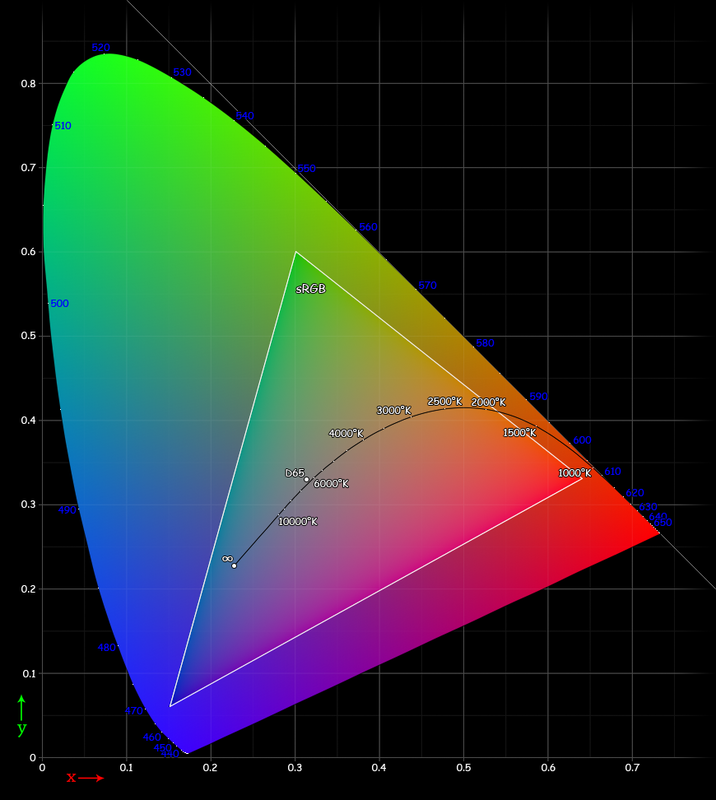 Similarly, RGB displays cannot show deep, saturated oranges or browns. So it only takes 3 different monochromatic stimuli to fool our eye into thinking it sees a color that is the same as another. 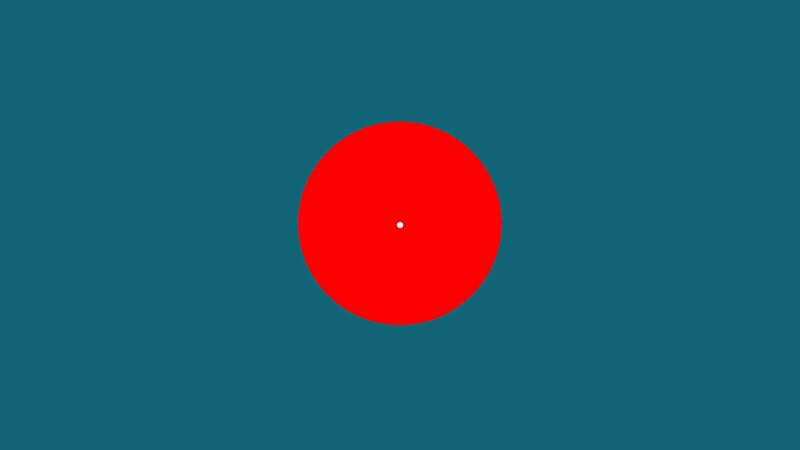 Red, green, and blue are good fits to the peaks of the frequency response curves of each type of color receptor. One more thing: "violet" and "purple" are not the same color. Violet is a pure color around 400 nm; but purple is a combination of red and blue. To our not-quite-perfect human eyes they look the same. If you pass a beam of pure violet through a triangular prism, the light will be bent but not broken up into components. If you then shine a beam of purple through the same prism, it will be separated into a blue and a red beam, with different amounts of "bend" to them. They don't. Aside from what others have said about the physical reasons not, from a practical computer graphics standpoint, representing either surface pigments or light sources with RGB color is insufficient to model colored lighting of a scene. For example there is no way to represent a material which is translucent or reflective only in a narrow band; you can only represent translucency or reflectivity of wide bands corresponding roughly to what the red, green, and blue cones in the human eye pick up. This actually matters for a lot of real-world colors in the pink/purple/violet family, which look radically different under different types of light, even different "white" light that looks identical when viewed on a white surface. Not the answer you're looking for? Browse other questions tagged color color-science color-separation or ask your own question. Why are RGB tertiary colors so similar to RGB primary colors?